This is a cartoon about genetics that I designed, to illustrate the concept of life balancing on a strand of dna, like a tightrope walker. My cartoons on genetics have been published in magazines such as Nature and Chemistry World (the magazine of the “Royal Society of Chemistry). 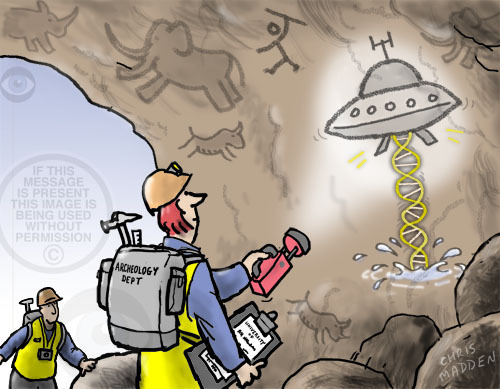 Click here to see more of my genetics cartoons. 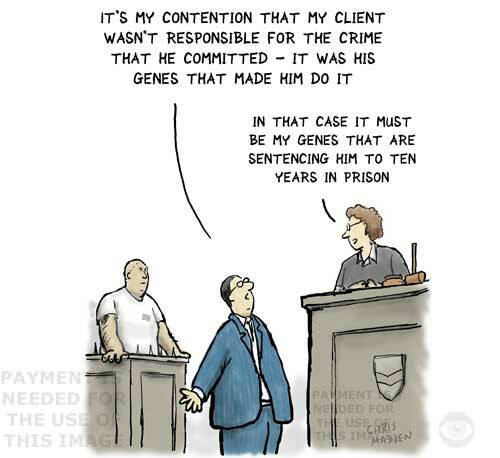 A cartoon about the possibility that criminal behaviour or deviant behaviour may sometimes (or often) have its roots in a person’s biology. 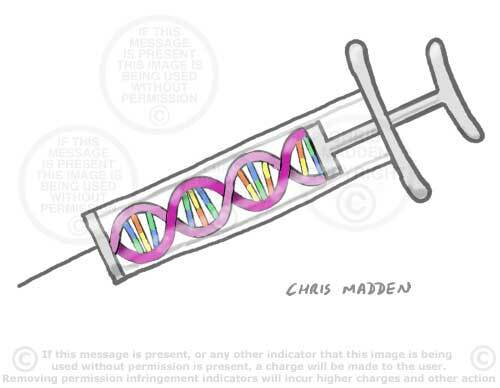 The cartoon illustrates the tendency of criminal lawyers to sometimes claim, for instance, that particular parts of dna or neurological makeup are responsible for criminal behaviour – thus removing responsibility from the person and placing it on the person’s dna or neurology. 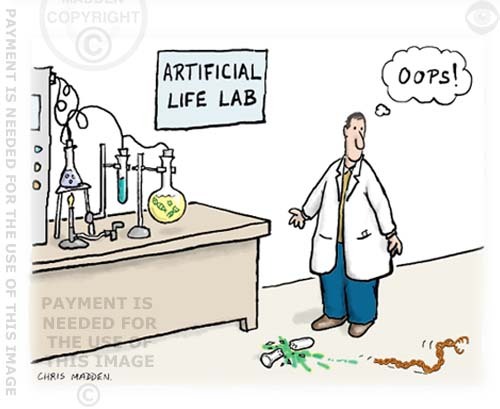 A cartoon showing a scientist in a science laboratory that does research into artificial life. He has dropped a test tube on the floor. A strand of dna is wriggling away, like a snake. The illustration shows a dna spiral with the Olympic rings integrated with it. Sports and Olympics cartoon. Genetic manipulation in competitive sport. Sports cartoon or illustration. Gene doping in sport. Is genetic testing of athletes needed? An illustration of the bulging biceps of a GMA (genetically modified athlete). This illustration is particularly pertinent due to the approaching London Olympic Games. 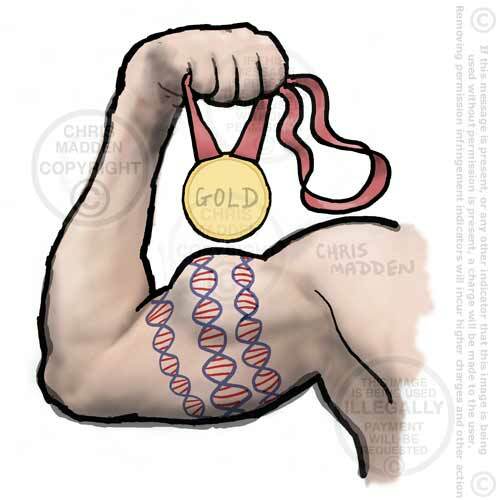 The illustration shows a muscular arm (possibly of a weightlifter or shot putter) holding a gold medal signifying that the athlete has come first in an event at the Olympic Games or a similar competitive sporting event. The bulging biceps on the arm display an armband type tattoo in the form of a dna double helix. The implication is that the athlete’s genes (modified or not) have influenced the fact that he has won the gold medal in the competition. A strand of dna depicted as a tightrope, with the double helix creating the strands of the rope. A person is walking along the strand. 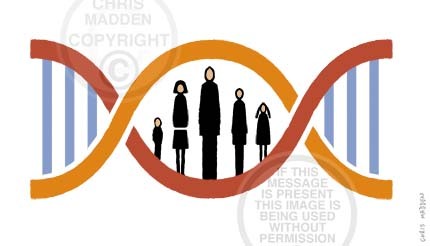 Cartoon of the dna double helix as a harp, playing the music of life.